Am späten Abend um circa 23 Uhr wird ein Augenstein auf dem Umm Al Ruyoul Square abgelegt. Wir sind auf dem Rückweg, aus Oman gekommen, wo wir die große Sandwüste Ar Rub al Khali in ihrem südlichen Teil durchfahren haben und wo wir einen Augenstein auf einem Grenzstein zwischen Oman und Saudiarabien abgelegt haben. Wir verbringen die letzte Nacht der Reise in Dubai und hier findet ein zweiter Augenstein seinen Platz. In dieser Parkanlage steht ein Gebäude, ein Turm, das Umm Al Ruyoul Morabaa. Seine Geschichte und Funktion ist im beigefügten Text erläutert, der in Englisch und Arabisch am Füße des kleinen Hügels zu lesen ist, auf dem der Turm steht. Auf der einen Seite des Gebäudes findet sich eine Stufe zum Sitzen, auf der wir im Schein des angestrahlten Hauses den Stein ablegen. Er schaut auf einige der nächtlich beleuchteten Hochhäuser von Dubai. Der folgende Text steht auf einer großen Tafel, auf Stein und eingelassen in die Mauer, die den kleinen Hügel mit dem Bauwerk umgibt. 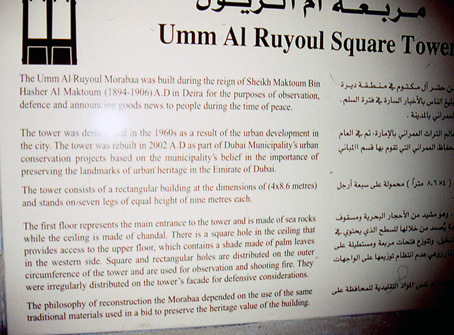 The Umm Al Ruyoul Morabas was built during the reign of Sheikh Maktoum Bin Hasher Al Maktoum (1894-1906) A.D. in Deira for the purposes of observation, defence and announcing good news to people during the time of peace. 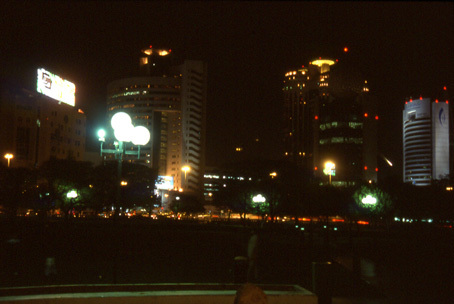 The tower was demolished in the 1960s as a result of the urban development in the city. 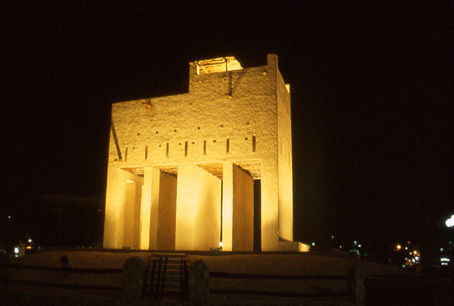 The tower was rebuilt in 2002 A.D as part of Dubai Municipality's urban conservation projects based on the municipality's belief in the importance of preserving the landmarks of urban heritage in the Emirate of Dubai. The tower consists of a rectangular building at the dimensions of (4x8.6 metres) and stands on seven legs of equal height of nine metres each. The first floor represents the main entrance to the tower and is made of sea rocks while the ceiling is made of chandal. There is a square hole in the ceiling that provides access to the upper floor, which contains a shade made of palm leaves in the western side. Square and rectangular holes are distributed on the outer circumference of the tower and are used for observation and shooting fire. 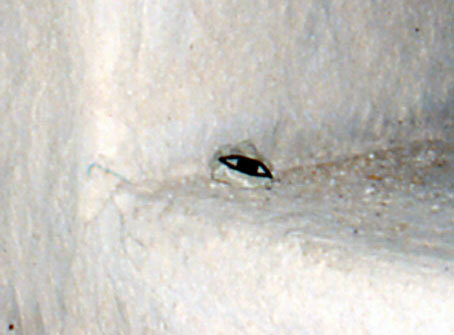 They were irregularly distributed on the tower's facade for defensive considerations. The philosophy of reconstruction the Morabaa depended on the use of the same traditional materials used in a bid to preserve the heritage value of the building.